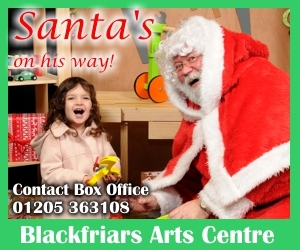 Blackfriars Theatre introduce the "Jazz at the 'Friars" shows. 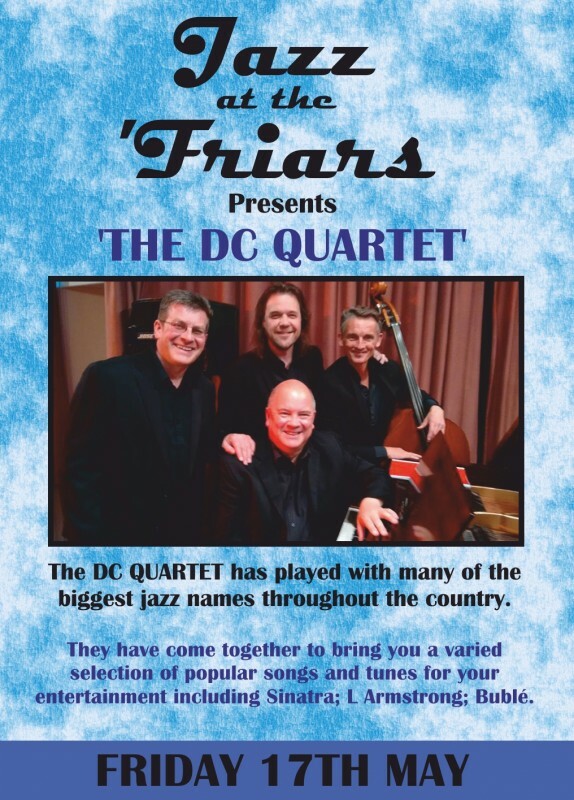 Starting with The DC Quartet, who have played with many of the biggest jazz names throughout the country and the come together to bring you a varied selection of popular songs and tunes for your entertainment, including Sinatra; L Armstrong and Buble to name a few. The quartet, which was the brain-child of drummer Dave Cook, has been working together for nearly 3 years, playing in jazz venues in Yorkshire and Lincolnshire building a reputation for playing melodic, accessible jazz and pleasing large audiences to critical acclaim with their particular style of arranging and playing. They will shortly be recording their first album of jazz and pop standards, which will be available in the autumn of 2019. An all-star band made up of four professional musicians who, individually, have worked with many well-known artistes at the highest levels of the music industry. Dave is a busy and versatile drummer. He has played in many musical situations ranging from jazz trios, pop bands, big band, brass bands, orchestras, as well as studio and recording work. He has played and directed many shows including Jesus Christ superstar, West Side Story, The Full Monty and High School Musical. He has played at some of the most prestigious venues in the country including the Royal Albert and Festival Hall London, MEN area, and also TV and radio work. Dave has performed with and along side many solo artists and bands, including Jim Bowen, Millie, Drifters, Searchers, Swinging Blue Jeans, Simon Webb, Joe Loss Orchestra, Chris Dean’s Syd Lawrence Orchestra, Bill Nelson, Roger Eno, Ray Lewis, The Four Tops, The Ivy League and many more. 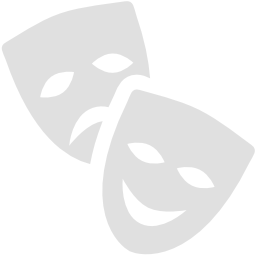 Gary has been performing professionally from his early teens. Playing in various working bands covering a wide range of musical styles from Ballroom Dance, Country Rock, Jazz & Pop. He has worked with many varying artists over the years from Bradley Walsh to Jimmy Tarbuck, Spike Robinson to Jack Emblow & Snake Davis to Gary Moore. Performing with his friends in the DC Quartet is one of his most enjoyable gigs. Since graduating from Newcastle College of Music in 1989, Warren has been in constant demand as a session player and side-man with some of the best known names in jazz and pop including Kenny Wheeler, Andy Sheppard and Jim Mullen. He plays both double bass and bass guitar and has also toured with Blur, Simon Webbe and The Drifters. A regular member of The Shannon Reilly Band featuring Pat McCarthy he also juggles his live performances with running his Cleethorpes live music venue and vegan café Moon on the Water. Barry Whitfield – piano is an accompanist, composer and director in several disciplines, with a strong background in arranging. He has been Musical Director for several youth productions at Grimsby Auditorium. He has achieved gold record sales on two occasions whilst working as musical consultant/arranger for Flair Records /N.O.W. Music. He is a respected session musician and has worked in TV and Radio with a diversity of leading musicians and cabaret artistes, including Sir James Galway, Lulu, Lenny Henry, Ronnie Corbett, Smokie & Black Lace as well as spending several years as assistant Musical Director to Sir Norman Wisdom. In the jazz world, hisown trio has made several appearances at venues and festivals throughout country. A partnership with the published poet Malcolm Carson resulted in the release of the album “Brechia” a specially commissioned work that had its inaugural performance at the Cumbria Arts Theatre, Carlisle. He has collaborated with many jazz musicians including the John Horler trio and Pat McCarthy for an event celebrating the life and work of the great jazz pianist, Bill Evans.